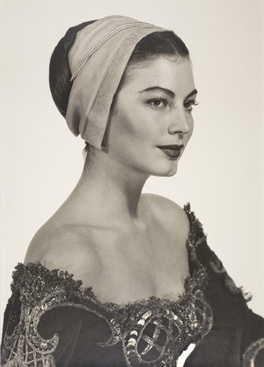 The National Portrait Gallery’s major retrospective of Man Ray portraits features an impressive range of the influential photographer’s works from 1916 to 1968. Some of the most interesting photos in the exhibition are those of Man Ray’s assistant and fellow photographer Lee Miller, with whose help Man Ray pioneered the technique of solarisation; a customised overexposure reversing areas of darkness and light, creating such ethereal images as Man Ray’s 1930 portrait of Miller, and used to dramatic effect in his portrait of model Jacqueline Goddard. Living in both America and Europe during his life, Man Ray’s work reads like a who’s who of this period. From portraits of Dada contemporary Marcel Duchamp in the guise of female alter-ego Belle Haleine in 1921, Man Ray went on to photograph some of the shining lights of modern celebrity culture in New York, Paris, London and Hollywood; just a few examples include Picasso, Coco Chanel, Virginia Woolf, Ava Gardner and Catherine Deneuve. Man Ray made a living through publishing in magazines like Vogue and Vanity Fair, increasing his own fame as well as that of his subjects. 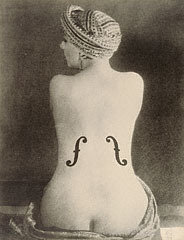 So many of the images in this exhibition, such as le Violon d’Ingres, are extremely well-known and have been widely reproduced, but this exhibition manages to situate these works in context and evoke some of the original sense of challenge and playfulness that epitomises Man Ray’s Surrealist style. The exhibition is open until 27 May.